This guy's art gets more and more appealing. I really hope he never gets put in charge of illustrating for the series (main games) in the future. Also his Mega Man is.... very um... bright eyed uh... "animey" I don't know, it just looks super generic. Actually scratch that, it looks like Pokemon official artwork. Ariga actually works with Pokemon illustrations. It's appealing, but you think it's generic. Yeah, okay, whatever. I love Ariga's style. It looks so robotic, but still friendly and human. I meant unappealing.... Jeez man put two and two together and try and understand a typo. I'd rather make fun of you for calling a very unique and fun spin on Megaman and Co's designs "generic." Ariga's style is like Smash Megaman before Smash Megaman was a thing.Heck, I'd say I probably like the detailed screws and panels and such even more on Ariga's take. Especially in conjunction with other details like the construction warning stripes on Gutsman. I'd rather make fun of you for liking steam powered looking, clunky, old fashioned, mechanically cliche, generically drawn designs that Ariga is known for over the advanced, sleek, authentically close to source material, clean and precise art style of the far superior Higurashi Ryuuji Mega Man redesigns for SSBWii&3DS. Or we can keep it civil and I'll leave you to your crap opinion, and I can stick with my good tastes and express them how I wish? So no one wants the keep it civil option? Might as well add some other alternatives. Let's see, children option check, civil option check. oh got it. Considering how long it's taken for this to come out, I kinda feel annoyed that they never reopened the submissions form for us to put more into it. I missed it the first time, and you'd think they would let us put new submissions if it was gonna take so long. I'm not seeing what looks like chamba's artwork because he is generally on point when he actually attempts to draw Rockman officially. What;s with this artist always get to draw Megaman Cover? Why it can;t be Shigeto Ikehara, Ryo Takamisaki and Iwamoto Yoshihiro? These 3 draw far better Megaman and doesn;t make Megaman look far different from it;s original design especially for Shigeto Ikehara. Really hate Ariga art style. To be honest.. I disliked Shigeto's art because of Rickman's face is a little bit odd and 1950's style to me. Ryo Takamisaki art is nice. Iwamoto Yoshihiro is so-so because of Rockman X's face is a little bit odd, really. I get other people maybe being tired of it, but I'm a big fan of Ariga's style/work. I love it, especially the power charging rings around Mega's buster. I do wonder if it's finalized, or if they're going to add more color later. Either way I think it's great, and I'm stoked they're doing a reprint. I missed out the first time around and it's been entirely too unaffordable since then. I mean, was the fanbase always this whiny, or did I just grow up? 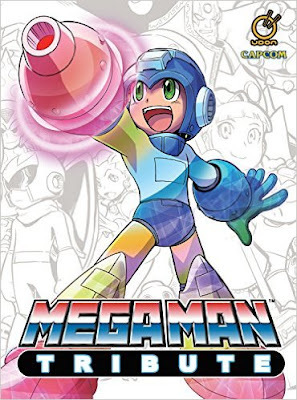 We constantly complain about Mega Man being "dead", then pick apart every little thing we do get, like the cover artwork of a re-print of a TRIBUTE book. Or maybe you shouldn't judge the entire fanbase by a few people who post on this website. I know idiotic blanket statements are the "in" thing right now, but come on. If the 12 people who bother to comment on this site like to complain, you're gonna see it a lot. Part of the trouble of allowing anonymous comments. The worst blanket statement is labeling any opinion as whiny as if people should only praise and nothing else, as if they can't express what they would like to see from the series continued and what not to be continued or done in the fist place. Get over yourselves yours are not the only thoughts that matter. Mega Man (to background characters): "Now I've got your colors!" I enjoyed Ariga's artworks but I am not fan of anybody. A fan is an idol and they do not worship you. Why should you ? Silly. Sorry about my English. Christ, remind me never to come back to the comments here. Absolutely toxic. I have never come across such spoiled and entitled brats in this fandom.